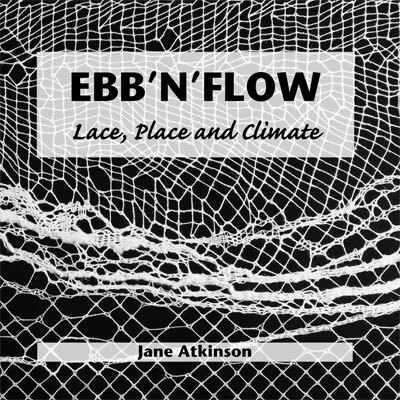 As a six-week contemporary lace exhibition in two venues, with four adult workshops and one for children, which started with a gathering of international lacemakers, strong community outreach underpinned the way Ebb’n’Flow showed lace as an art form inspired by the landscape of Stanpit Marsh in Christchurch Harbour. Based at Walford Mill Crafts but also involving the nearby Priest’s House Museum in central Wimborne, it drew 5,248 visitors from around the UK, who left enthusiastic comments: ‘well worth the 90-minute drive – wonderful exhibition’; ‘blown away, such beauty’; ‘well worth the journey – loved reading the design inspiration and development’. Some stayed all weekend. Hanne Behrens from Denmark and Cheri Dunnigan from Florida flew in to meet them, and after Pierre’s opening presentation and workshop, joined with Denise Watts and Jane Atkinson as Lauran passed on her skills in metal lace to the group. We also cooked and relaxed together at the home of Lily and Clive Wills, who had generously offered accommodation to the foreign visitors. Pierre had coped nobly with 16 students; a total of 32 adults and six local schoolchildren enjoyed the workshops, which also included necklaces in gold thread and design inspired by bark patterns. The children made gauze-gilled fishes inspired by mullet fry in the river. Jane joined members of Poole Bobbin Lace Circle, Christchurch Lace Society and Wimborne Lace Group in demonstrating during the show, their efforts much appreciated by visitors such as the one who wrote: ; ‘what a lovely surprise! We did not even know there was modern lace, let alone in colourful thread. The lacemakers told us so many fascinating historical facts, too’. The underpinning theme was climate change, examined for the way it had destroyed the natural phenomena on the marsh, preserved as delicate memories in bobbin lace. Ebb’n’Flow itself is now a memory, but one which leaves a legacy of skill and ingenuity, international co-operation and friendship, and benefitted from much community goodwill. Grateful thanks to all who participated. 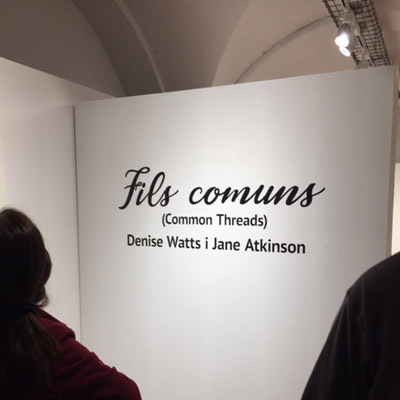 Exhibition in Catalonia with my friend Denise Watts. You can read more here (Events page). Buy the book to keep, printed on high-quality paper, from the Shop. You can also read the first part of it on-line here (6Mb download). 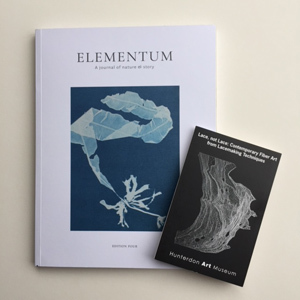 Read the Elementum 4 feature on 'Seableed', made for ‘Lace, not Lace’ at the Hunterdon Art Museum, New Jersey, USA.